Trusted welcomes Rays moving and Storage as our 2nd Trusted Saskatoon Movers & Storage and Glenwood becomes our final Trusted Saskatoon Auto Repair & Service and 2nd Saskatoon Tire store! Trusted loves to brag about the businesses we find, and we are so excited to be introducing the 2 latest Trusted businesses to www.trustedsaskatoon.com, as they both fall in the the top 5 NIGHTMARE categories, you know the categories where you are apt to hear the most horror stories of people being ripped off or most stressed about.....we take EXTRA care at Trusted to ensure we only find the best representatives as our goal is to help YOU the public by saving you TIME, MONEY and STRESS. When we give ' The Thumbs up' to a business it MEANS something. How many times have you heard about people being ripped off when it comes to getting their vehicle fixed? Single women and older people feel especially vunerable. If the vehicle is newer many people choose to pay more and take their cars back to the delaership to get fixed, as they just don't want to risk being taken for a ride ( literally).. I am sure you have heard about women being made to feel very rather stupid because they just don't know much about what go's on underneath the hood of their car...or perhaps because they have had an uncomfortable experience because of the testosterone/ sexist environment in the shop itself..whatever you have experienced personally , or heard about , there is no doubt that Auto Repair and Service fall in that Top5 ..and as we look at the website data for www.trusetdsaskatoon.com it shows that in Saskatoon it is the 5th most viewed category after Contractors, landscaping, Air Conditioning and Dentists categories! So we are thrilled to close out our 3 Trusted Auto Repair and Service listings and our 2nd Trusted Tire listing with Glenwood Auto Service . 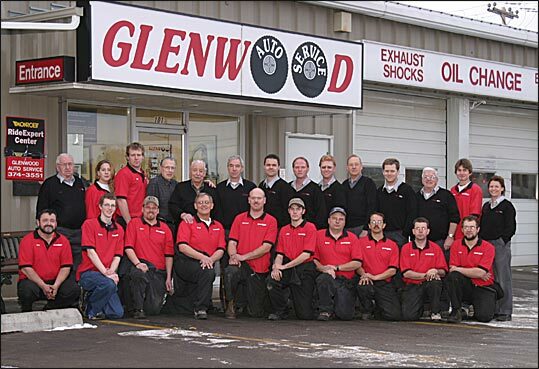 Let us give you a little bit of history about Glenwood and what sets them apart from those ' stereotypical' Garage services. Our 2nd Business that we are bragging about today is a Movers Storage company in Saskatoon, and there is NO DOUBT that most people have heard or experienced first hand what happens when you have suffered at the hands of a bad moving company....Damaged possessions, rude and lazy staff, stolen items or cherished belongings that have just been thrown into badly packed boxes by packers that didn't care. The Trusted owner herself had a horrendous moving experience early this year with a local firm ....she wishes that she had found the two moving companies that are Trusted to move her 2 households into one....it was a very costly move ...with lots of damages and plenty of additional stress! The staff at Rays Moving and Storage in Saskatoon make your moving day as stress and hassle free as humanly possible...they move you as if they were moving their own family, and the testimonials that we got from their clients just proved that they deserve the 'Thumbs up' from Trusted. Check out their listing HERE to read some of them for yourself! What is very interesting and quite a coincidence between Rays and Glenwood who we just talked about is that BOTH companies have a connection to 1973..thats 38 years ago....that in itself is an indicator of how good they are at what they do. Lets share the Rays history with you, as it really is a great story! Originally, Ray and Leona Diehl founded the company in 1949 when they purchased a truck in hopes of making enough money for a down payment on a farm.Rays Transport was founded. In 1954, Ray's diversified into moving and storage. This remained a small part of the operation until Ray's Moving & Storage was incorporated as a separate company in 1973. Since its incorporation in 1973, Ray's has been the recipient of numerous awards, including outstanding quality service as rated by United Van Line customers across Canada for the years in 1999 through to 2003. Ray's Moving & Storage Co. Ltd. has been a member of the Saskatoon & District Chamber of Commerce and the North Saskatoon Business Association for a number of years.Rays also believes in actively supporting its local associations and athletic teams. So if you are moving now, soon or in the future..or perhaps you have belongings you need to put into storage long or short term be smart and make the simple choice of choosing Rays a verified and approved TRUSTED moving and storage company in Saskatoon! Call Mark and the team and let them help you with your next move! Just a reminder that Trusted is promoting and sponsoring a WONDERFUL Fundraising event for Child Find Saskatchewan at the Saskatoons Broadway Theater on Wed September 21st at 7pm. Child Find Saskatchewan is a Provincial charitable organization that educates and advocates for the protection and rights of children and youth. They believe all children have the right to be safe. They are excited to present The amazing : Dr. Draw. Dr.Draw is a Canadian electronic band, after the nickname of their leader Eugene Draw. Draw plays electric violin like you have never seen before and incorporates a guitarist, an electronic keyboardist, an electric harpist, an electric cellist, a rock bassist and a drummer. Dr. Draw’s musical repertoire spans the globe, incorporating many different elements such as rock, classical, pop, electronica, fusion, world and new funk, making this eclectic mix appealing to a diverse audience. Dr. Draw made indie music history in Toronto in 2007 as all three of his albums charted on the official Top 30 Nielsen Sound scan sales chart for his CD “Adagio” Monies raised at this fundraiser will help Child Find Saskatchewan promote awareness of the issues relating to missing children...and it will be a darn good show too! "A MISSING CHILD IS EVERYONES RESPONSIBILITY"
Trusted welcomes our First Trusted SASKATOON PICTURE FRAMER And introduces our 2nd Trusted Consultant comes on board! What a busy time we are having everywhere in Saskatchewan..this wonderful Summer has put every one in a great mood and that is translating into more and more businesses taking the leap with Trusted...well why wouldn't they ...after all what is the most important thing a business has...it's REPUTATION..and what better a thing to invest in than your TRUST FACTOR! 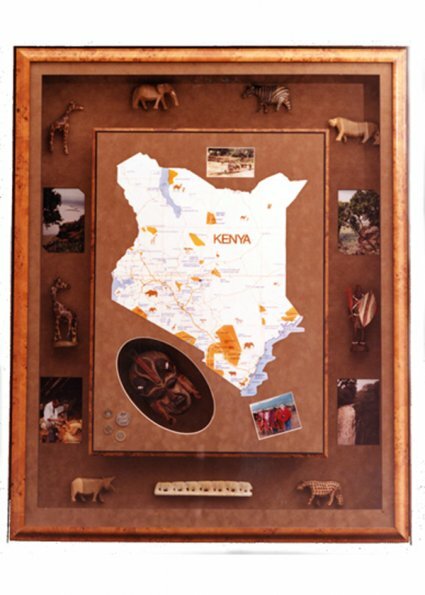 Sherry had lots of GREAT testimonials when we did the survey ..but none quite as impressive as the personal testimonial from the acclaimed local artist Glen Scrimshaw , who was taught how to frame by Sherry..she is the only person he Trusts to frame his originals...need we say anymore? Check out the J & S Listing for your self by clicking here. What a fabulous edition to our Trusted site! Welcome J&S Picture Frame Warehouse..in the pink building in Sutherland..they LOVE what they do ..and it shows! Last but NOT least Trusted is thrilled to announce that it is not only the wonderful businesses we have talked about tonight, or the many many that will be up and live in the next few weeks as they pass our strict testing and qualification procedure with flying colors that are becoming Trusted..we also have a new Trusted Consultant to add to our impressive staff line up! Welcome Renee Larre as our first Trusted Regina Consultant, Renee comes originally from Saskatoon and has lived in Regina for a few years, she is a devoted Wife and Mother, and she brings her profesional, hard working, optimistic attitude to Trusted. After struggling herself when moving to Regina from Saskatoon to find businesses that could be Trusted , she knew exactly how much of a wonderful stress, time and money saving solution www.trustedregina.com would have been to her ..and still will be when it launches...so that makes a fabulous all women team of Heather Boyko our www.trustedsaskatoon.com Trusted consultant, Sara Wheelwright , Founder/Trusted Owner and Renee to make a TRIO of people out hunting for the next Trusted partner ..and Saskatoon just launched May 30th ..hows that for growth! Trusted is thrilled to announce the first live listing on www.trustedregina.com. Welcome Winmar, our first Trusted Regina Contractor and Renovations listing. The Trusted team are working hard finding great businesses and offering them the unique opportunity to invest in THE most important thing they own..their reputation. By investing in their ' Trust factor' they can differentiate themselves from the 'other companies' in their category that perhaps don't do such a good job...and by partnering themselves with Trusted, they can demonstrate how they are willing to ' put themselves out there' on the Trusted websites as they contract themselves to uphold the 5 TRUSTED GUARANTEES , which are the cornerstone of what Trusted is all about! We are thrilled to introduce you to our first Trusted Regina business..
WINMAR is our first Trusted business to go live and has a listing in the Contractor and Renovations category in Regina..lets tell you a little bit about why they deserve a place with us. PLUS General Construction ..to put EVERTHING back together again. Anna and her dedicated team were working around the clock to help the unfortunate victims of the extensive flooding this year South of Regina, and they helped many , many Saskatchewan families in their hour of need. We think the list covers it all....but if it doesn't mention what you are looking for, stil call Winmar because they will answer no matter what time of the day or night ..and they will be there to HELP YOU when you need it the most..they are committed to working in your best interests and the positive comments and testimonials from their clients during our survey and on their listiing (CLICK HERE to see it) speak volumes.... call WINMAR FIRST!! Winmar Regina office and fleet. A reminder that we are thrilled to be sponsoring a WONDERFUL Fundraising event for Child Find Saskatchewan at the Saskatoons Broadway Theater on Wed September 21st at 7pm. Child Find Saskatchewan is a Provincial charitable organization that educates and advocates for the protection and rights of children and youth. They believe all children have the right to be safe. They are excited to present The amazing : Dr. Draw. Dr.Draw is a Canadian electronic band, after the nickname of their leader Eugene Draw. Draw plays electric violin like you have never seen before and incorporates a guitarist, an electronic keyboardist, an electric harpist, an electric cellist, a rock bassist and a drummer. Dr. Draw’s musical repertoire spans the globe, incorporating many different elements such as rock, classical, pop, electronica, fusion, world and new funk, making this eclectic mix appealing to a diverse audience. Dr. Draw made indie music history in Toronto in 2007 as all three of his albums charted on the official Top 30 Nielsen Sound scan sales chart for his CD “Adagio” Monies raised at this fundraiser will help Child Find Saskatchewan promote awareness of the issues relating to missing children...and it will be a darn good show too! We are so proud to have a wonderful TRIO of Trusted Flooring stores to promote on trustedsaskatoon.com , and End of The Roll is an extremely worthy 3rd and final listing to close the category. All you have to do is take note of the fact that they are winners of the 'Consumer Chioce Awards' for Top Flooring Store 2010, Top Flooring Store 2011 and Top Flooring Distributor 2011 , and you will see why they came highly recommended to Trusted. The owner Rod Mellquist leads from the front and loves what he does for a living ..the staff are helpful, friendly, knowledgeable and you can tell they enjoy working in the store and for Rod....which makes for a great shopping environment...NO PRESSURE at all! 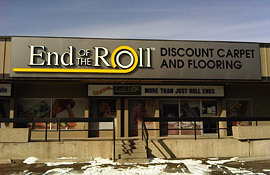 The selection of flooring available is very impressive...you name it they have it..aswell as some bargain 'end of the rolls ' too! Trusted believes in giving back and will be having a consistent presence in community charities/ non profits and events in all of the Trusted cities we service..in July we sponsored the Tourism Saskatoon golf tournament , we are partners with Tourism Saskatoon , as we know many newcomers visit places they are moving to BEFORE they move and we want to be able to provide them with Trusted resources..think about it .. things like Trusted Hotels for when they visit ...and then Trusted realtors, mortgage brokers, legal and financial services to assist them if they are considering relocation to the city..then of course we have all the Trusted services and stores they need once they get here..how better to give a good impression to potential newcomers than to provide a helpfull resource like www.trustedsaskatoon.com to ensure their first experiences are positive ones...check out Tourism Saskatoons banner ad below that appears on our home page! With that in mind, we are thrilled to be sponsoring a WONDERFUL Fundraising event for Child Find Saskatchewan at the Saskatoons Broadway Theater on Wed September 21st at 7pm. Child Find Saskatchewan is a Provincial charitable organization that educates and advocates for the protection and rights of children and youth. They believe all children have the right to be safe. They are excited to present The amazing : Dr. Draw. Dr.Draw is a Canadian electronic band, after the nickname of their leader Eugene Draw. Draw plays electric violin like you have never seen before and incorporates a guitarist, an electronic keyboardist, an electric harpist, an electric cellist, a rock bassist and a drummer. Dr. Draw’s musical repertoire spans the globe, incorporating many different elements such as rock, classical, pop, electronica, fusion, world and new funk, making this eclectic mix appealing to a diverse audience. Dr. Draw made indie music history in Toronto in 2007 as all three of his albums charted on the official Top 30 Nielsen Sound scan sales chart for his CD “Adagio” Monies raised at this fundraiser will help Child Find Saskatchewan promote awareness of the issues relating to missing children...and it will be a darn good show too!